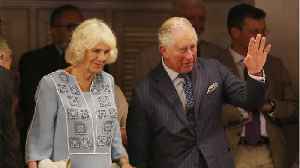 Prince Charles and wife Camilla joined in a party in Gloucestershire to celebrate the Queen's 90th birthday. 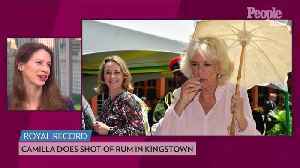 </head> The Prince of Wales and The Duchess of Cornwall attended a street party to celebrate the 90th Birthday of Her Majesty Queen Elizabeth II, in Gloucestershire on Sunday (June 12). The celebration was part of 'The Big Lunch' - an organisation of which Camilla is patron. 'The Big Lunch' aims to bring together people and their neighbours in an attempt to improve community spirit. The royal couple were invited to Brimpsfield, a village in the county of Gloucestershire, to celebrate the Queen's birthday with locals. 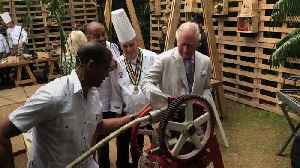 Charles and Camilla shared sandwiches and drinks with the villagers and met with people of all ages. Many of the younger members of the crowds were dressed up - with Camilla admiring a child in a corgi costume and another in a beefeater outfit. The Prince of Wales even watched a sponge throwing game - but declined to join in. Charles and Camilla sat at numerous tables of guests during their visit and looked to be enjoying themselves. 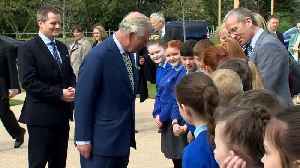 Prince Charles was even seen to be drinking beer and joining in with a very lively rendition of the Welsh national anthem (Gloucestershire borders Wales). 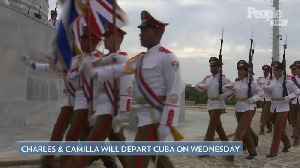 The royal couple were honoured at the event - and Camilla left clutching a bouquet of flowers.